Typically, value stocks are those that have a unique feature working in their favor which results in the potential to create value over a period of time. What do we understand by value stocks? There are different ways to define a value stock, but the broadest definition is that of a stock that has hidden value. Typically, value stocks are those that have a unique feature working in their favor which results in the potential to create value over a period of time. Value stocks are normally about the long term only. In India, we have seen stocks like Eicher and Havells create tremendous value over 10-15 years. The best example, of course, is Wipro where an investment of Rs1,000 in 1980 would be worth nearly Rs60cr today. The big question is how to identify a value stock. While there is no royal route to identifying value stocks (as Euclid would have loved to put it), there is definitely a multi-factor model that we can look at. 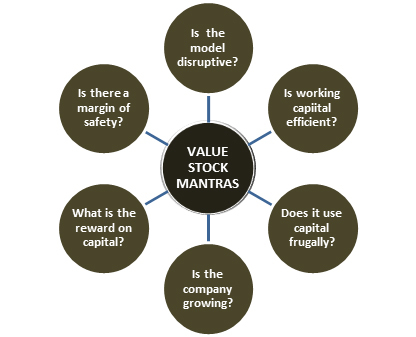 Here is a 6-factor model at how to identify value stocks. Disruptive businesses are the most likely to become value stocks. Markets are normally wary of giving high valuations to a stock unless it proves itself. This is where we saw value creation by companies such as Hero Moto which redefined the two-wheeler industry with its fuel-efficient bikes. We have also seen Indigo (Interglobe Aviation) disrupting the aviation industry with a mix of low costs and efficient operations resulting in a 42% market share in a short span of time. A classic instance is Infosys which disrupted the global IT services business. This is the first test of a value stock. We ignore the importance of working capital management in creating value. A company like Amazon which gets a longer credit period than it gives has created tremendous value because each additional unit sold is being value accretive to the business. In the 1990s, Arvind got into trouble due to lax working capital management. Maruti has created value in the last 15 years with its very efficient inventory management. In fact, if you want to take a contrary approach, just cancel out companies with weak working capital models. When we talk of value, we find that low-debt companies are typical value creators. But, you need to go a step further. Focus on companies that are able to run the business with low debt and low equity. Eicher, Infosys, and Wipro created wealth with a very lean debt structure. Thus, the low financial risk always kept their cost of capital low and enhanced valuations. Companies like Tata Tele with huge equity bases had such diluted earnings that they could never veritably create value for shareholders. This is where we bring in the growth aspect into value investing. What does this mean? A company growing at 7% and quoting at a P/E of 11X may be less of a value stock compared to a company growing at 25% and quoting at a P/E of 16X. PEG is the P/E ratio adjusted for the growth in earnings. That is where you need to look for the dichotomy in valuations. When the P/E is reasonable and the earnings are likely to grow exponentially, you have a value stock in front of you. Keep an eye on the PEG. The return on equity (ROE) and the return on capital employed (ROCE) are the two most important ratios that depict rewards on capital. While the ROE is the return to the equity shareholder, the ROCE is the return to all stakeholders. What should the ideal ratio be? Warren Buffett gives an interesting mantra to identify value stocks. According to Buffett, if the ROE and the ROCE are above 15% each and both are close to each other, it is the sign of a value stock. Be cautious if the ROCE is sharply higher than ROE because it means company’s debt is more attractive than equity. Again, this is an important way to identify a value stock. Moat refers to a unique kind of entry barrier that the company has managed to create. This entry barrier can be in the form of a brand, distribution network, pricing power, etc. The margin of safety is the final test. 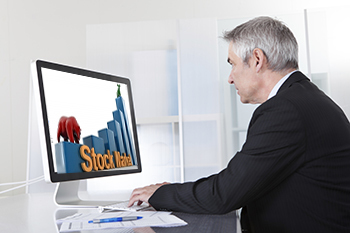 A value stock is good only if it is available in the market substantially below its intrinsic value. Value stocks are hard to find and the 6-factor model can be a good starting point!